For SS19, HOKA ONE ONE has launched a new collection called The Sky Series; a range of boots built with running shoe lightness, feel and comfort, but with the protection, traction and technical features needed for crossing the most rugged of landscapes. HOKA was developed in the mountains; steep goat paths, technical trails and switchbacks are the founders’ playground. They created their fun crossing terrain as fast as they could, whether it be running, cycling, climbing or scrambling. The HOKA running shoe held them back and so it led them to develop the Sky Series. The Sky Series consists of three boots: the Kaha, Arkali and Toa. No matter how high or how far the trail leads, the boots are designed to be ultralight, yet rugged, and with maximum cushioning, you can get out anywhere – way out there. 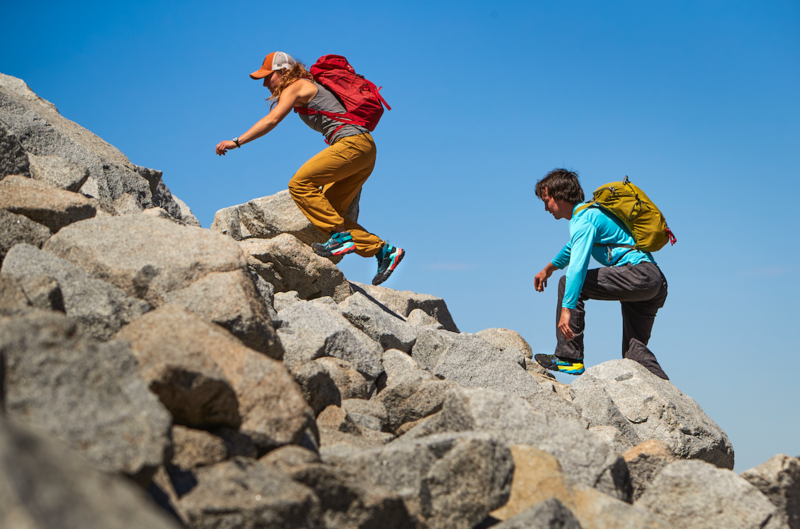 The Kaha, or maximal hiking boot, gives both strength and support. Offering surprising speed, it makes the ups easier and the downs quicker. Unequalled in its weight-to-cushion ratio, the boot offers the full package – proprietary foams, patented geometries and exceptional Vibram® Megagrip traction. The Arkali, or vertical hiking boot, heralds a whole new breed of boot. There’s off road, off trail and then there’s off the map. Combining running shoe technology with hiking boot engineering, a MATRYX ® upper, high-abrasion toe cap and adjustable heel and ankle straps, the Arkali is ready for anything. The Toa, or fast hiking boot, takes inspiration from HOKA’s tail running expertise and innovations, offering a lightest-in-class boot for adventures across any terrain. All elements have been considered with functionality and weight in mind, such as the rubberised foam midsole and the Vibram® Megagrip outsole lugs. Get out there and seek new adventures. With HOKA, the Sky’s the limit!